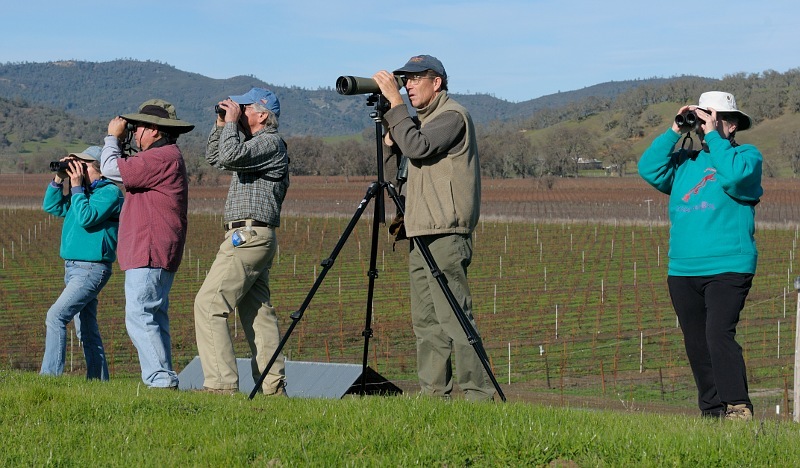 Currently, Napa-Solano Audubon Society has a field trip or bird walk scheduled every Saturday or Sunday. These walks are led by one of our chapter's more experienced birders. To learn about these walks you must sign up for our Field Trip email list as the locations for these walks are announced on Wednesday or Thursday of each week and are subject to occasional last minute cancellations. We also have Beginning Bird Walks scheduled for two Saturdays each month. These bi-weekly Saturday Walks tend to be shorter outings, usually to a local birding hot spot in Napa or Solano County. Information about the beginning bird walks can be found on our website. Once a month from September through June, we have a monthly field trip (on Saturday or Sunday) to multiple birding locations, but these trips usually last six or more hours. Newcomers and bird watchers of all levels are most welcome! Attending a field trip is a great way to find new birding locales, learn more about birds and get to know more about us. Check out our Field Trip Schedule to see when our next trip is scheduled, and where the carpools depart. Come and join the fun! Note: Field trip bird sightings are posted on our Facebook page. So if you miss a trip, take a look at what birds were seen. You may want to check the area on your own at a later date. Join our Field Trip email list! We have an email list dedicated to sending information and last minute updates about weekly field trips. Click here to learn more and ask to be added to our list. What to Bring: In general, for Saturday field trips, pack a lunch, or at least bring snacks. Bring plenty of water or other liquids, and be prepared to carry your lunch and water if necessary. It’s always a good idea to wear a hat, bring sunscreen and bug repellent. Dress in layers. Don’t forget your binoculars! We have binoculars available to borrow.